Costa Marina as seen sailing past Spaarnwoude at the Northsea Canal from Amsterdam to IJmuiden at the 20th of may 2008. Costa Marina and her sister Costa Allegra were built as a part of a class of five containerships for the Johnson Line of Sweden around 1970. Axel Johnson, the later Costa Marina, was the first one that was launched, on the 16th of january 1969. She was followed by Annie Johnson, the later Costa Allegra that was launched on the 29th of april of the same year. A thirth ship was launched the same year under the name Margaret Johnson. In 1970, San Fransisco was launched followed by Antonia Johnson in 1971. The history of the Johnson Line started in 1890 when a company named AB Nordstjernan was founded by Axel Johnson. In this year he bought his first ship, the former HAPAG-ship Cyklop. He renamed this ship after his wife, Annie Therese. A year later, he had a ship built named after himself, Axel Johnson. In 1904, the company opened a route to South America and this route was named Johnson Line. The company grew fast within the first decades of the twentieth century, opening several route's to the Pacific and South and North America. They sailed with freight as well as passengers, and their ships were mostly handsome looking combination-liners. Throughout the years, the company bought their own shipyard and they became involved in the steel industry. In the late 1940's, a route to the Far East was also opened and AB Nordstjernan became one of the largest shipowning companies of Scandinavia. In 1966, Johnson Line ordered their first containerships from Wärtsilä in Finland and those were to become the Axel Johnson-class. In 1982, Johnson Line merged with Svea Line, also member of AB Nordstjernan and became part of the Silja Line. In 1990 Johnson Line merged with another Silja Line company, Effoa and formed Effjohn. So, in 1990 Johnson Line ceased as an independent company. Axel Johnson measured 16.285 tons and she had accomodation for 4 passengers. Her lenght was 174,73 meters and she was used on the Johnson Line services from Sweden and several other European ports to South America. From the middle of the 1980's onwards, after Johnson Line had become a part of the Silja Line consortium, it was clear Silja was concentrating on passenger ferries. The containerservices of Johnson Line ended and the three first ships of the class were sold to Regency Cruises in 1986, a cruiseline formed in 1984. Regency planned to rebuilt these ships into cruiseliners, Axel Johnson was planned to become Regent Sun, Annie Johnson was to become Regent Moon and Margaret Johnson was to become Regent Sky. But eventually, nothing happened, except for the sale to the breakers of the Margaret Johnson, after her steering gear and engines were rebuilt into the Regent Star, the former Statendam of Holland America Line, built in 1957. Rebuilding started first on Axel Johnson on the Mariotti-wharf in Genoa, Italy, not for Regency though. Her new name was to become Sea Venture, but later she bacame the Italia for the Napels-based Navyclub Italia. Navyclub didn't finish the rebuilding of the ship, and she was eventually sold in 1988 to Costa Cruises and when she re-entered service in july 1990 she bore the name Costa Marina. She was the second ship for Costa that had her name started with Costa as prefix, exept for the Costa Riviera, former ships of this Italian company were always named after family members of the Costa family, like the Johnson Line had also done. She emerged some centimeters shorter then before, her tonnage was increased to 25.441 and she had space on board for 1025 passengers. A lot of people don't think these ships look attractive, but in my opinion, as seen above, the former containership emerged as a nice looking cruiseliner. Still a little boxy in some ways but quite nice rebuilding was done to her. Her funnel is easily recognizable because it consists out of five funnels in one. Two of these were painted white and three were painted in Costa-yellow. This multi-funnel concept was also used on the newbuilds Costa Romantica and Costa Classica. Also, Costa Victoria of 1996 was given a funnel based on this design so this became a Costa Cruises trademark in the early 1990's. Although this funnel-design is not used anymore on the newest Costa ships, I found it nice to see a pastry baked for the luncheon on Costa Luminosa during my visit to this ship in 2010, on wich the multiple funnels again were present. Nice fact again for Costa Marina is that her name was not spelled entirely in capital letters, also something Costa did not do because the ships bore the names of the Costa family. Later ships of the line did not have this anymore so Costa Marina was the last ship named in this former tradition. On the 19th of july 1990, Costa Marina made one short voyage with invited guests and at the 22nd she departed for her first cruise in the Mediterranean. For Costa, her history is somewhat similar to that of her sister, sailing mostly Mediterranean cruises in summer and Caribbean cruises in winter. Being a small ship, she could offer her passeners another type of cruise then mostly seen aboard the ships of the main cruisecompanies. These small Costa-sisters had their own clientele and were able to attract passengers that like to sail with a main company, but do not want to be on a megaship. That was cleverly shown in the ships interiours, they lack the glittery looks and large lounges seen on the larger ships and had a very fine and sophisticated decor, truly based on the charm of Italy. A lot of glass, art, soft colouring and marble was used to give the ships a unique style within the Costa-fleet. Like Costa Allegra, also Costa Marina was used on a specific market after the year 2002. Between 2002 and 2004, she was especially marketed for German passengers, sailing northern European cruises in summertime out of Kiel. In 2006, the ship offered cruises in the Red Sea, trying to open up the market in the Middle East. With pirate-attacks and the unrest in the region, it doesn't seem to be a good place to take your vacation, but it was very succesfull, where there are many places in the region that do offer a safe and exceptional holiday-experience. Costa Cruises is now one of the most succesfull lines in the region, as well as in Asia. After some more then 20 years of service with Costa, the ships were getting older and even the passengers searching for a holiday in a more classic style started to choose for other ships. 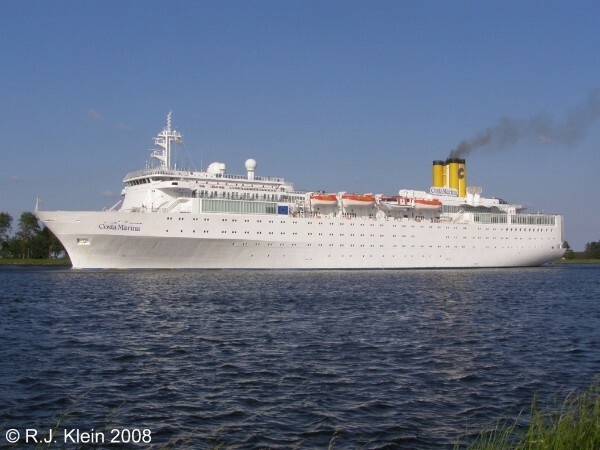 Costa had their Costa Romantica rebuilt in a similar style, but being far larger, the ship could offer more to her passengers and also recieved balconies, something that nowadays is a must-have in the cruise-industry. In newer markets like Asia, passengers are less demanding and still travel for the cruise itself, so it was decided in late 2011 to sell the ship to a new Asian company, Harmony Cruise, that is based in South Korea. For them, in was planned to bring the ship into service as the Harmony Princess. Meanwhile, the other former containership Costa Allegra had already sailed as Allegra for the revived Paquet Cruises of France, but suffered a large fire in the end of february 2012 and was sold for scrap. To replace both ships, especially for Red Sea cruising, Costa chartered the Grand Voyager from Iberocruceros and renamed her Costa Voyager. In size, this ship is comparable to the Costa Marina and Costa Allegra, but because she is built in the year 1999, she is more modern then the former 1969-built containervessels. In 2012, the former Costa Marina was brought into Asian service with Harmony Cruise under the name of Club Harmony. At the 16th of february 2012, the ship was delivered to her new owners and although she is an oldie, in Korea she is regarded as a very luxury vessel. In fact, she is the first cruiseship ever to set sail from a Korean port, so she can be proud to achieve an industries first at an age of 43 years. She is sailing 5-day cruises to Japan from Korea and she is not expensive to sail, her prices range from 399.000 won to 1.009.000 won. This sound a little expensive, but it is the same as around 353 to 966 US dollars. The eastern venture of the ship wasn't that sussecfull though as her owners had hoped for and in august of 2014, the 45-year old Club Harmony was sold to the breakers at Alang in India where she arrived in the end of august.